On Sunday 16th September, Judgement Sundays will bring to the end its 13th season this summer with a succession of heavy-hitting DJs and live performers. The brainchild of Judge Jules, Judgement Sundays has forged a reputation over its 12 previous seasons as a club night with very few equals. Housed in San Antonio’s Eden, Judgement Sundays possibly creates one of Ibiza’s must-see club nights, seamed together by some top DJs playing in a fantastic atmosphere. In annual tradition, Judgement Sundays will be hosting its Ibiza closing party with a line-up of big name DJs alongside some up and coming stars of tomorrow. 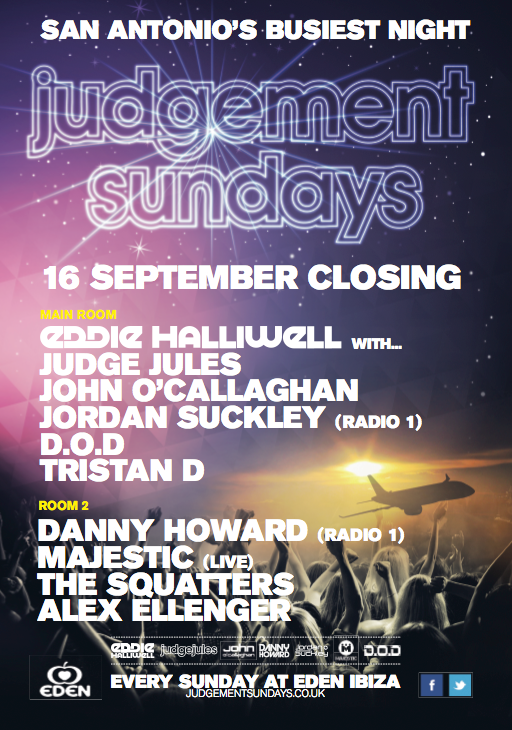 For the final instalment of the season, Judgement Sundays has enlisted the talents of Eddie Halliwell, John O’Callaghan, Jordan Suckley (Radio1), Danny Howard (Radio1) and many others to conclude this summer’s season with a bang. This is a big one as Judge Jules and the entire Judgement Sundays team bring to an end another great season as San Antonio’s top club night. 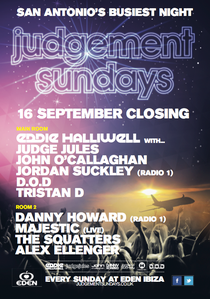 For full info and line-up, check: www.judgementsundays.co.uk.